The history of American anarchists, and of Jewish anarchists in particular, has been forgotten, largely overshadowed by the history of the more well known (and far less defensible) American communist movement. Two recent books—neither of them is a conventional biography—reintroduce us to two fascinating 20th-century Jewish anarchists. The volumes are almost as quirky and unconventional as their subjects. The J. Abrams Book: The Life and Work of an Exceptional Personality is a kind of scrapbook-memoir published by friends and coworkers of the subject after his death in 1953; Left of the Left: My Memories of Sam Dolgoff is by the subject’s son Anatole, who keeps up a running dialogue with his long-dead father. The J. Abrams Book contains fragments of the subject’s autobiography. The most compelling is his account of the five years he spent in the Soviet Union, which takes up half of the book. Surprisingly, nothing that Jacob (“Jack”) Abrams put in writing deals directly with the famous Supreme Court case that bears his name: Abrams v. United States. It’s the free speech case with which every law school graduate must be at least vaguely familiar, without necessarily remembering anything about the man it immortalized. Defendants in Abrams v. United States departing for Russia, November 24, 1921. From left, Samuel Lipman, Hyman Lachowsky, Mollie Steimer, and Jacob Abrams. On August 22, 1918, they dropped five thousand of these leaflets from a tenement rooftop on the Lower East Side. They were quickly arrested and charged with conspiracy “to unlawfully utter, print, write and publish . . . disloyal, scurrilous, and abusive language about the form of government of the United States . . . language intended to incite, provoke, and encourage resistance to the United States in the war with Germany.” The trial was held in October, in an atmosphere permeated by patriotic bond drives and Liberty Loan rallies. Judge Henry DeLamar Clayton Jr., a former senator, betrayed his feelings during a cross-examination of Abrams. Speaking in a soft voice with a Yiddish accent, Abrams tried his best to defend what he meant by his anarchist beliefs: “This government was built on a revolution. When our forefathers of the American Revolution . . .”—which was as far as he managed to get. “Your what?” Judge Clayton asked. The jurors got his point. Two weeks later the defendants were found guilty. Three of them, Abrams, Samuel Lipman, and Hyman Lachowsky, were given the maximum sentence of 20 years in prison. The fourth, Mollie Steimer, received 15 years, probably because she was a young woman. The defendants appealed the case, which went to the Supreme Court and was filed as Abrams v. United States. The majority of the court affirmed the sentence, but it led to one of Justice Oliver Wendell Holmes Jr.’s most famous dissents (in which Justice Louis Brandeis joined him). Holmes’s argument that only the “clear and present danger” of immediate evil could justify restricting speech was a milestone in the defense of freedom of speech. Abrams and his fellow defendants spent two years in jail while their attorney Harry Weinberger worked out a deal: The defendants would be released with the stipulation that they leave for Russia—their birthplace—at their own expense and never return to the United States. On November 24, 1921, Abrams, his wife Mary, and his fellow defendants set sail for the USSR. While there are scores of books on the history of American communism, students of American politics tend to forget that, as the historian Kenyon Zimmer pointed out in his book Immigrants Against the State, anarchists once outnumbered Marxists, and by 1910 there were a few hundred thousand of them in this country. Indeed, up to World War II, Zimmer wrote, they “remained a significant—though largely forgotten—element of the American Left.” Unlike today’s masked rock-throwers, they stood for the creation of a peaceful, stateless, antiauthoritarian society where people would freely join together to govern themselves. In America, anarchist groups were largely organized by their members’ countries of origin: German, Italian, Spanish, and so on. However, it was Jewish immigrants from Eastern Europe who settled in New York City that became the movement’s most influential and enthusiastic adherents. Many immigrants from poor working-class families, sent out to work at an early age and afforded only a limited education, were drawn to anarcho-syndicalism, which held out the promise that revolutionary industrial unionism would ultimately result in the workers’ control of the economy and transform society into an anarchist utopia. Jewish anarchists pursued their arguments in New York’s lively radical Yiddish-language subculture. Although they were not ashamed of their Jewish heritage, as atheists they rejected Judaism and famously held an annual Yom Kippur Ball, mocking the holiest day on the Jewish calendar. The J. Abrams Book contains Abrams’s account of his childhood in Russia, where he was born in 1886, and continues with his arrival in the United States in 1908; his deportation back to what had become the Soviet Union in 1921; his flight from the Soviet Union five years later; and his arrival in Mexico, where he spent the last 30 years of his life. To call his childhood painful is an understatement. After his mother died when he was four and his stepmother rejected him, he had to sleep on the floor between doorways, was often hungry, and dressed in ragged hand-me-downs. His older sister Manya took care of him, and eventually apprenticed him to a bookbinder and printer whose workers introduced him to the revolutionary antitsarist underground. Manya left for America in 1906 and sent for Jack two years later. He settled on the Lower East Side, got a job as a bookbinder, joined the International Brotherhood of Bookbinders, and was elected president of the local. His future wife, Mary Domsky, was active in the Amalgamated Clothing Workers union (she narrowly escaped dying in the tragic and famous Triangle Shirtwaist Company fire). Abrams had met her before the fire on picket lines and at forums where they heard talks by Emma Goldman, Alexander Berkman, and other anarchists. Abrams, who was already a revolutionary but not yet an anarchist, was persuaded. Realizing that if he and Mary wanted to leave he would have to find employment in an enterprise that was not run directly by the Soviet state, he quit his job. Since their housing was tied to government employment, they were immediately evicted. They had to live in the corridor for six weeks, until a friend took them into his apartment, which was meant for one person but now housed six. As it happened, two of the spaces were taken by political tourists, Ronald Radosh’s parents. Abrams asked if when they returned to New York, they would tell the truth about how people really lived in the workers’ paradise. Reuben Radosh told him that he would not, since he had to defend the idea of the Soviet revolution, not depict its reality, to which Abrams responded, “happy is the believer, for whom even bad things become transformed into good ones.” In 1926, Abrams told the commissars that he and Mary would be of more value to the revolution in other countries, a fable he told them in the hope he would get official permission to leave. Much to his surprise, after an interrogation at the infamous Lubyanka prison, he and Mary received two passports. They gladly left Russia for good (albeit with the GPU on their trail). 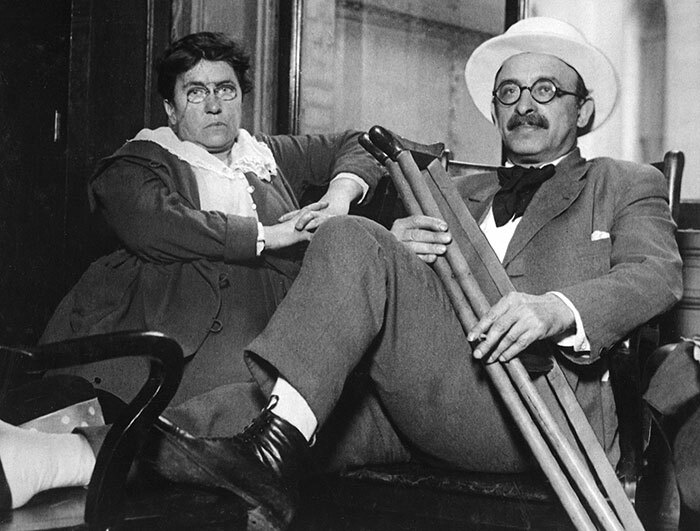 Emma Goldman and Alexander Berkman had earlier learned a similar lesson during their Russian exile. Like the proverbial canaries in a coal mine, the American anarchists became the first critics on the Left to expose the horrors of Bolshevism. The next year, Abrams and Mary arrived in Mexico, where the National Revolutionary Party had come to power. 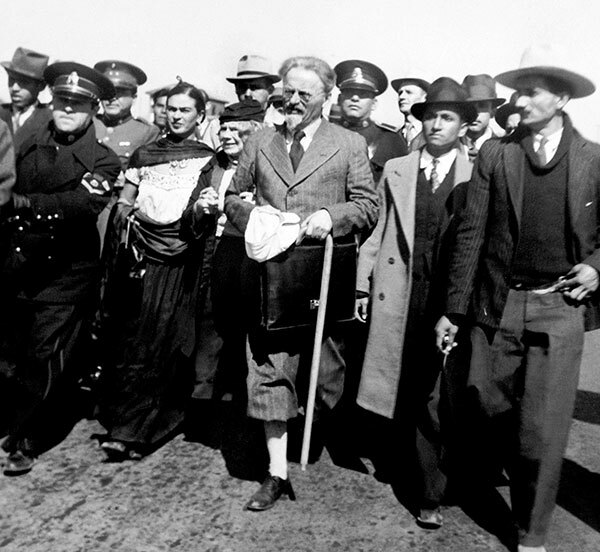 There weren’t many anarchists in Mexico, but they were welcomed by the small but growing Jewish community. “In Jewish Mexico,” one of his friends wrote in tribute, “it was the community activists of the younger [Jewish] generation who were his audiences and his adherents.” Eventually Abrams became a director of the Jewish Cultural Center. He found work as a photographer and then set up a printing shop where he printed Yiddish books and newspapers. He also chaired Mexico’s International Committee Against Fascism, which supported the Republican forces in the Spanish Civil War. When refugees began arriving after Franco’s victory, Abrams organized to help them and other antifascist exiles. I’m only fifty-percent in agreement with you. I agree with what you say about your former comrades when you condemn them. However, here’s where we part ways. I don’t agree that if you were in Stalin’s place, you would be better. Dictatorship has its own logic; perhaps you would be even worse. When Trotsky told him that he took pride in his order to have the Red Army put down the attempted rebellion of the Kronstadt sailors during the civil war Abrams condemned him to which Trotsky responded, “I would have done the same if it took place now,” thereby verifying Abrams’ critique. In Left of the Left: My Memories of Sam Dolgoff, Anatole Dolgoff sets out to tell not only his family’s story but also “the history of a culture, and of a chapter of American radicalism that few people know about.” Dolgoff strives to give an emotionally honest and impartial look at his parents and himself, warts and all, although he seems to be harder on himself. Looking back, he writes that except for his parents, “I doubt there is much to my life you would find interesting.” His academic career at the New York City College of Technology teaching physics paled in comparison. At the end of his career, he found that his father was more and more on his mind, and students complained that “I talk about my parents too much, proof to them that I am over the hill and growing senile.” He was neither and wrote the book after he retired. 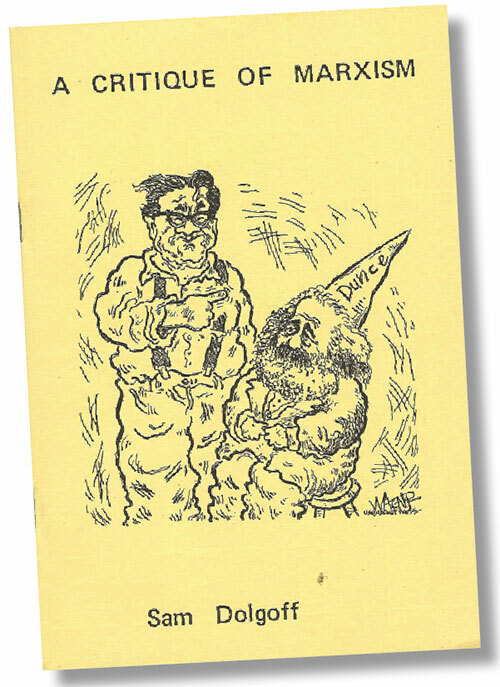 Sam Dolgoff’s 1983 self-published critique of Marx’s theory of economic determinism and the state, as well as Marxist views on the early socialist labor movement, peasantry, and the Paris Commune. He joined the Industrial Workers of the World (IWW) in 1922 and became a migratory worker riding the rails, propagating anarcho-syndicalist ideas, and participating in strikes. On a trip to Cleveland he met Esther Miller, a delegate from the Anarchist Forum who had agreed to meet a speaker from the IWW on the steps of the library. After an hour of waiting, she started to leave when she looked more closely at a hobo who had been pacing back and forth there for the whole time. Of course, it was Sam. 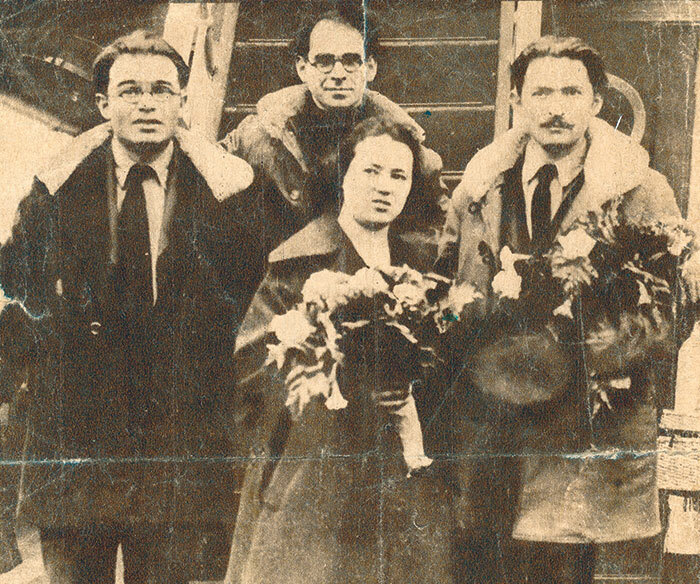 Anatole Dolgoff describes his father during this period as having “a strong face, a rugged Russian Jewish face, wild black hair swept back, acute black eyes behind the glasses, a prominent nose,” and he quotes an acquaintance as saying that Sam looked like he combed his hair with an eggbeater. Esther, by contrast, was a “proper young lady from a striving, high-achieving, first-generation immigrant family—well mannered, well spoken, and immaculately dressed” who had earned an MA in English literature. Her family thought it was perverse of her to “run off with a Wobbly, a filthy hobo house painter,” but they were married for 58 years. In 1933, Sam and Esther moved to Stelton, New Jersey, a “largely anarchistic colony,” but concluded that such places were “essentially self-isolationist forms of escapism.” They settled in New York City where Sam, together with Carlo Tresca and his circle of Italian anarchists, helped found the Vanguard Group, an anarcho-communist group that largely propagated “the ideas of Bakunin and Kropotkin.” Sam edited and wrote a column for its publication, Vanguard: A Libertarian Communist Journal, focusing on the American labor movement. Sam Dolgoff had many great traits, but the greatest of all was a nobility of character—a human sympathy that made him side with the downtrodden . . . He taught me how to look at the world through eyes that are not the same as the official eyes of the state and the big establishment and the ideologues. 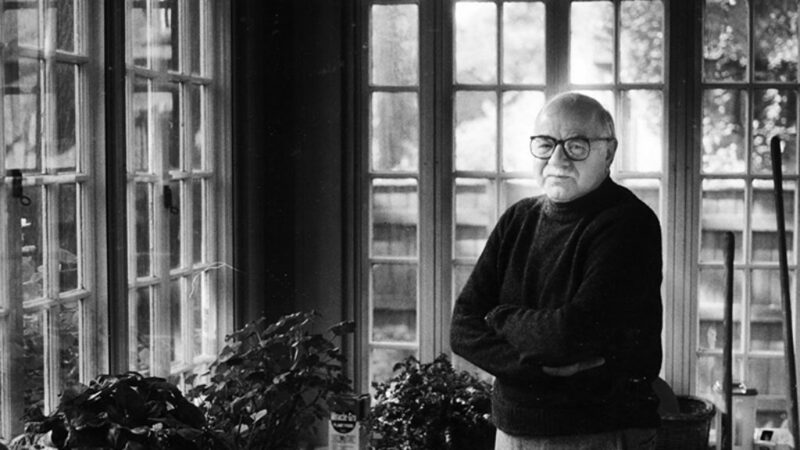 Jack Abrams and Sam Dolgoff shared more than their identities as anarcho-syndicalists. They were both idealistic, courageous, single-minded, and passionate in fighting for their cause and for freedom not only in America but internationally. Like many of their fellow Jewish immigrants they were self-taught and eager to learn; they were working-class intellectuals and charismatic orators—a lost Jewish type. They were also fortunate to marry women (who in anarchist fashion were referred to as “life companions”) who were devoted to their shared cause. What then did these Jewish anarchists accomplish? After all, they not only failed to achieve their lifelong dream of a free cooperative society without a state to rule over them; they failed to attract enough believers in that dream to keep the movement alive. Perhaps their biggest mistake was the belief that humankind was basically good despite all they had experienced to the contrary. On the other hand, they were clear-eyed, even prophetic, in their early disillusionment with communism. They were dreamers, but their dream was a noble one and worthy of being remembered. Allis Radosh and Ronald Radosh are coauthors of A Safe Haven: Harry S. Truman and the Founding of Israel (HarperCollins). Allis is an independent historian, and Ronald is a contributing opinion columnist for the Daily Beast and an adjunct fellow at the Hudson Institute. I found this review both funny and side, highly imaginative and informative as well. I knew the name "Sam Dolgoff" (I am also a good friend of Ron & Allis Radosh), but not Jack Abrams. Their stories, as retold in this review, are amazing. As some one who grew up in a fellow traveling family (friends of Communists), we did not think about, talk about or consider the existence of anarchists. I am aware, as I know Ron & Allis are, of some of the violent groups of anarchists and their violent actions that killed some people. Sam & Jack don't seem to be of that inclination - I wonder if they write about though. Also as a Cantor in a synagogue (although growing up an aetheist) I wonder how much Jack and Sam realized their concern for human rights, for the poor, for democratic decency, was founded in Judaism, in the religion which was the first to speak of loving your brother as yourself and for caring for the stranger. In their own anti-religious ways, they were rabbis (teachers) to many who worked and are working for a better world, who know (unlike them as the Radoshes describe) that humans are (far from) perfect, containing the Yetzer Harah and the Yetzer Tov, feelings of good and evil, but there is still hope, despite today's horrible leadership of our country, for a better world. Harry Wolfson, Reinhold Niebuhr, and chutzpah.